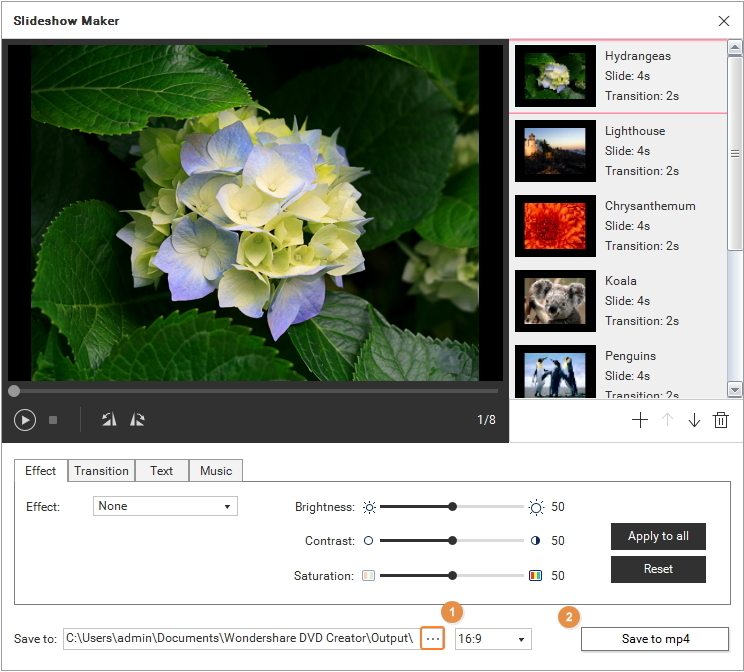 Wondershare DVD Creator is also an easy-to-use slideshow maker with music and effect, which enables you to create perfect photo slideshows. Below are the detailed steps for your reference. Run Wondershare DVD Creator and click More DVD Tools >> to access the built-in Toolbox. You can also go to Create a DVD Video Disc or Create a Blu-ray(BDMV) Disc and click the top right Toolbox button to get the main interface of Toolbox. Then hit Slideshow Maker to get the window of the built-in slideshow creator. Click to add the photos you want to trim from your local computer. Then the loaded the photo thumbnails will be displayed in sequence just as the screenshot shows. If you want to adjust the photo sequence, just select the photo and click or . As you can see from the screenshot, Wondershare Slideshow Maker provides Effect, Transition, Text and Music 4 photo editing features. 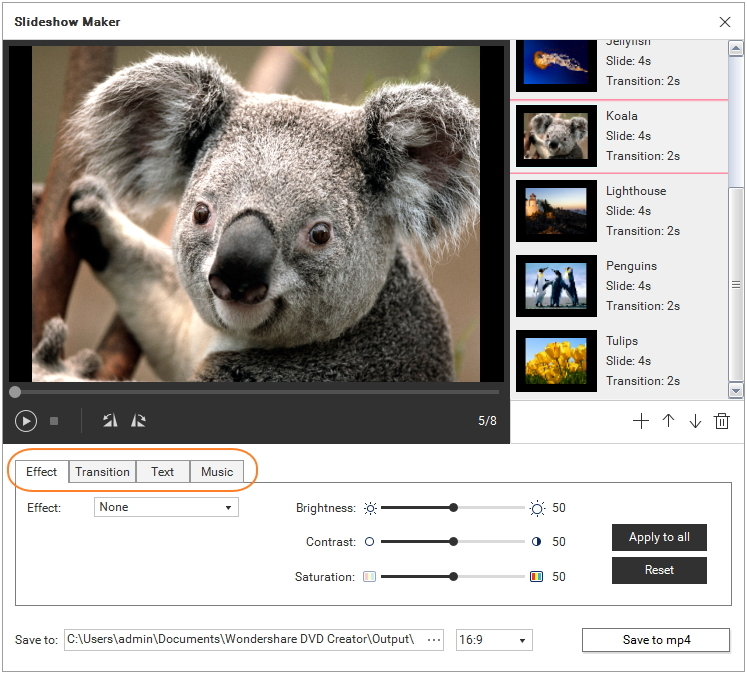 Click beside Effect to select your preferred photo effect, or adjust the photo parameters like Brightness, Contrast and Saturation. 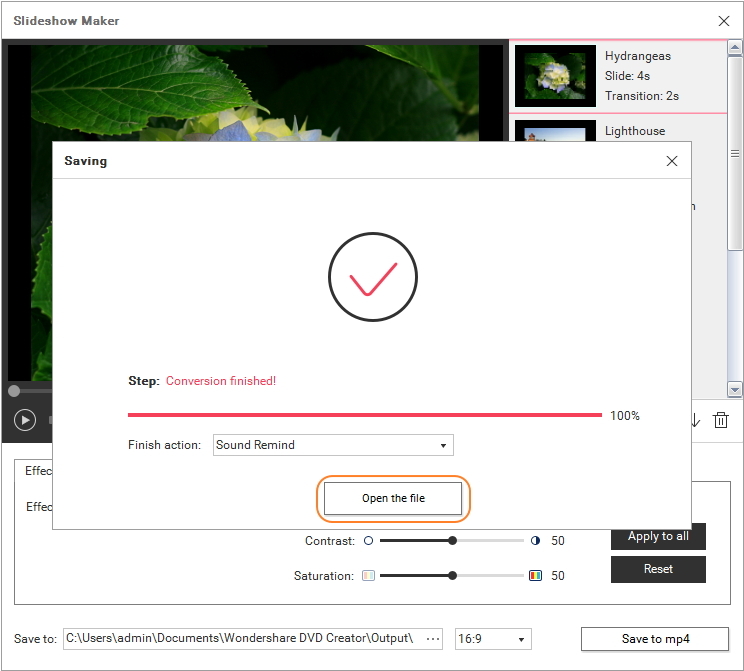 Switch to Transition tab, you'll be able to change Photo Duration or Transition Duration from the default 4 or 2 seconds to your desired duration. In addition, you can add various transition effects to the photos. You can either click beside Transition Effect to pick your favorite or set it Random mode. Click Text tab and enter the text you want to add on photo. After that, change Font, Color, Size or Style of the text if you need. Go to Music tab and click to add your favorite music to the photo slideshow. 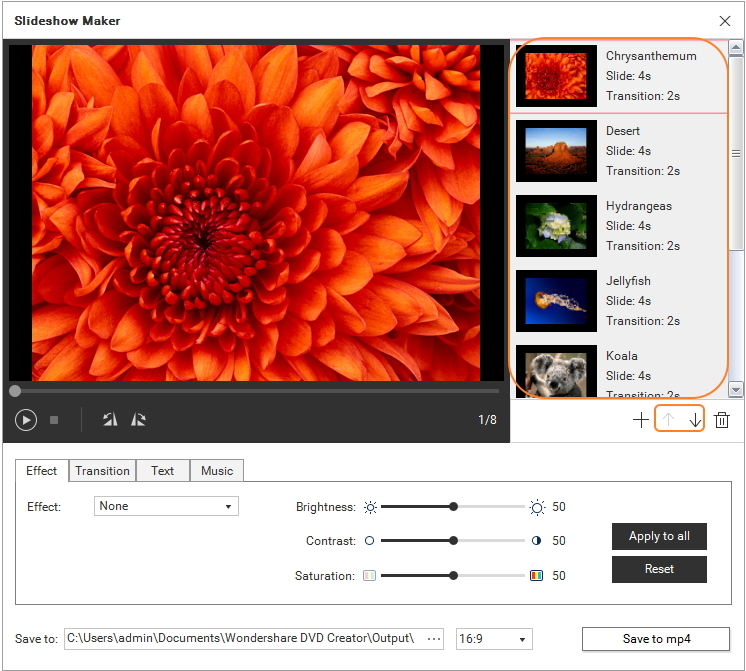 Wondershare DVD Creator offers 3 music files and selects one as background music by default. If you want to remove background music, just click as circled in the screenshot. After that, you can choose to add Fade In, Fade Out or Auto Repeat effect to the just added music, or trim the music file to your favorite part. Clicking Apply to all would apply one specific photo effect, transition setting or text to the whole photo slideshow. If you're not satisfied with above photo editings, just hit Reset to cancel. 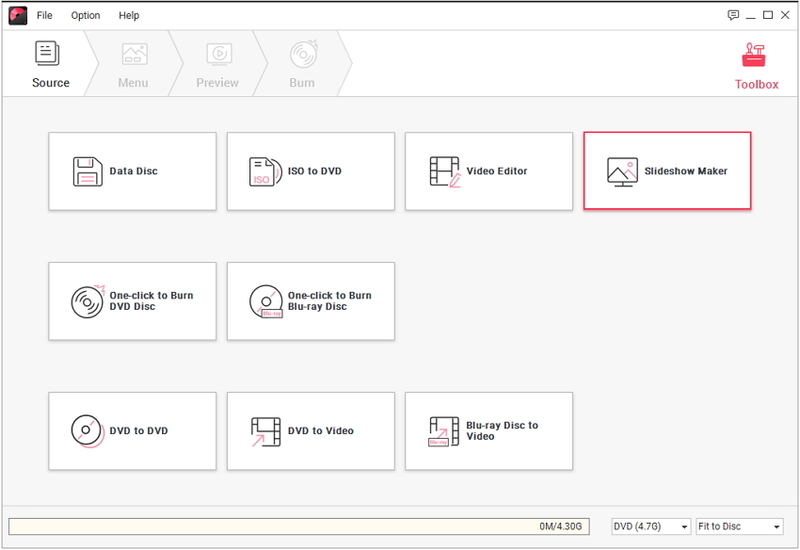 When everything is set, click ... to specify the folder to save the photo slideshow and press Save to mp4 to proceed. 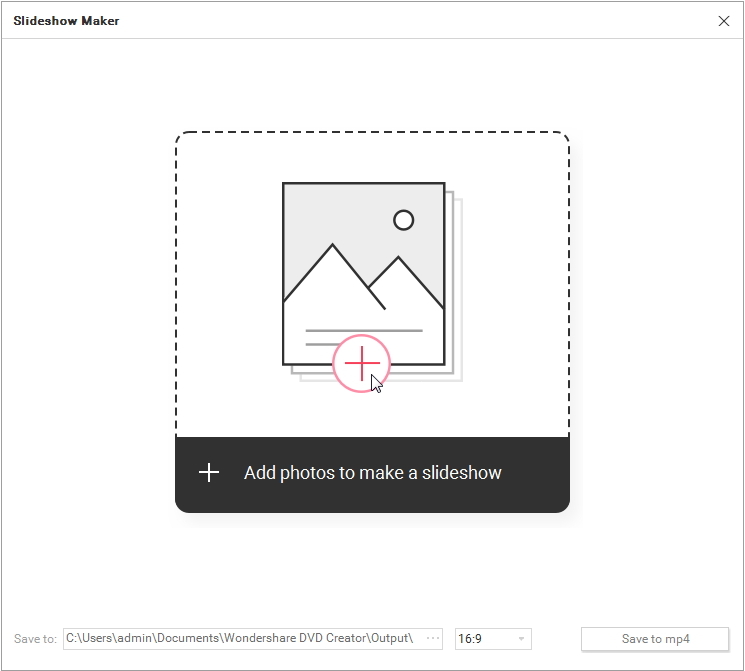 Within seconds, you'll get a popup window as the screenshot shows and clicking Open the file would navigate you to the photo slideshow video.